My favorite meal at Addis Bar and Grill. It tastes better than it looks, I promise. I’ve embraced the “if not now, when?” motto in 2013. But all this change calls for some things to stay the same. I guess that’s why I refuse to order something new from Addis Bar and Grill. Maybe the sweet sting of curry I smell when I enter the restaurant puts me into a trance. Maybe the wealth of options makes me panic and I choose something familiar and safe. Or maybe I’ve just found one dish at one restaurant that makes me happy enough to never branch out. Addis Grill is an Ethiopian and Mediterranean restaurant on Fourth Street about a half a block south of Main Street in downtown Louisville. If provoked, I could probably give exact latitude and longitude coordinates — my day job is within spitting distance to Addis. Yet, it took me more than a year to stop in and try this eatery that is tucked away in the shadows behind concrete pillars. 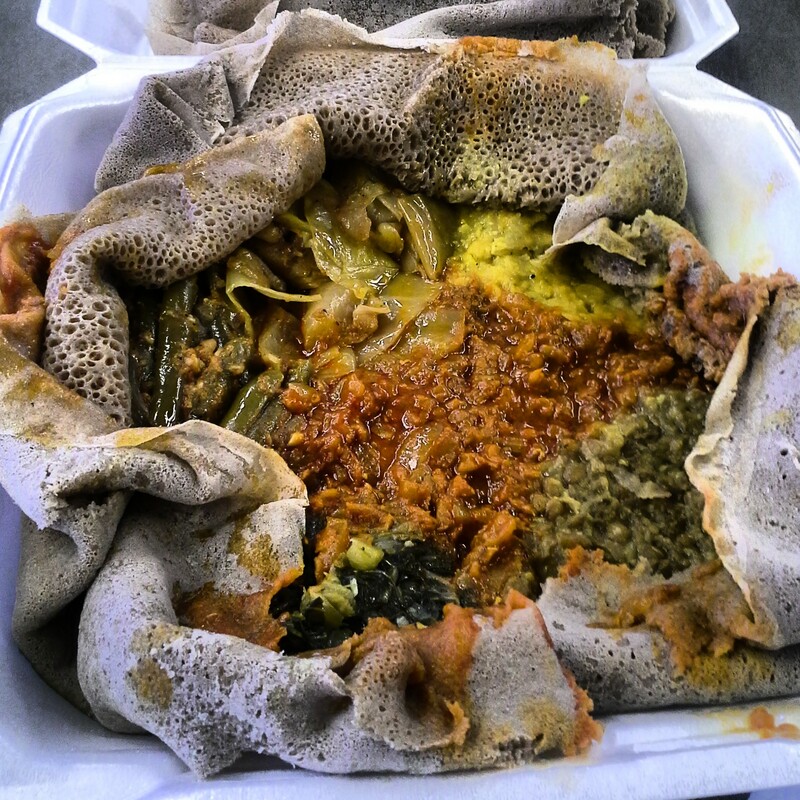 I ignored Addis as I walked several times a week to the more bustling food corridors of downtown Louisville for lunch. One day, I got sick of the usual line-up of sandwiches, salads, and Mexican-inspired fare that I usually turned for a midday meal. A co-worker recommended Addis, a more international option than my usual standbys that was less than a five-minute walk from the office. Addis serves up a broad menu that provides the chance to sample basic Mediterranean dishes. Appetizers, such as baba ghannouj ($4.75), creamy hummus ($4.75) and stuffed grape leaves ($4.99), are inexpensive enough to allow the more hesitant diner to try something new without spending too much money. The variety of dishes are wonderful for pleasing a group of hungry colleagues with diverse tastes, such as a selection of kabobs for meat-eaters ($7.95 to $12.95 depending on the meat) or vegetarian dishes such as the mujaddarah ($6.95). It was love at first sight. Variety? Check. Lots of vegetables, so it’s probably somewhat healthy? Check. Only $7.95? I couldn’t order fast enough. The meal lost some of its visual luster when the employees stuffed everything in a Styrofoam container. Don’t be turned off by appearances — looks aren’t everything. Just let the spicy fragrance transport your mind to another world. 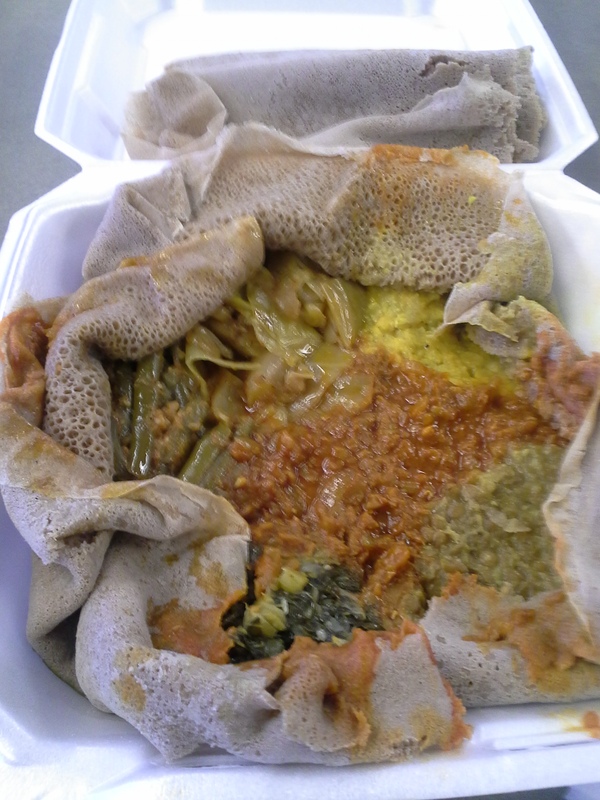 A full, un-Instagrammed view of the Ethiopian Vegetarian. The Ethiopian Vegetarian is served over injera, a spongy, slightly bitter flatbread. Injera is very porous, so all the flavors from the thick stews on top seep into the bread. Injera is like an edible plate, and who doesn’t like dinnerware they can eat? Though the stews are rubbing elbows with one another, each has a distinct flavor and texture. My favorite selection is the misir wot, a fragrant, rich lentil stew with a warm, spicy flavor. I also love the firmness of the cabbage, string beans and collard greens, a nice change from the more mushy texture of the lentils and split peas. I’ve been to Addis three times in the past month. I have only ordered the Ethiopian Vegetarian. I’m sure the rest of the menu is just as delightful, but this spicy selection made a big enough impression that I don’t want to venture out. My co-workers love the chicken curry that is served with rice, hummus and pita and only $8.49. One day, I’ll try it. Visit Addis for lunch when the prices are a little cheaper than at dinner, but make sure to arrive before noon or you could face a line. Addis Bar and Grill, 109 S. Fourth Street, Louisville, Ky.
I’ve never heard of Addis, but this sounds amazing! I’ll have to try it soon!